French director Alexandre Moors made a splash a few years ago with Blue Caprice, a drama that attempted to explore the mind of the DC Sniper John Allen Muhammad. It was a tremendous film that I considered one of the year's best, but it sadly flew under the radar. Moors has laid low since then but he returned last year at Sundance with another color-themed film, The Yellow Birds, and the war movie is finally coming home. 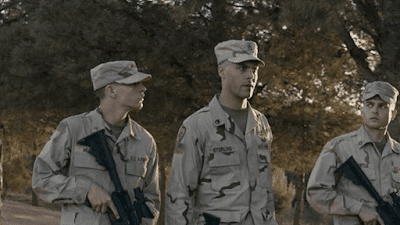 Based on the book by Kevin Powers and once eyed by David Lowery (A Ghost Story) as a potential directing gig, The Yellow Birds centers on two soldiers who become good friends during the Iraq War. But when one suffers a tragic fate, it's up to the other to explain to the soldier's mother that he failed in a promise made before deployment. The film has an impressive cast led by Han Solo himself, Alden Ehrenreich, along with Tye Sheridan, Jennifer Aniston, Toni Collette, Jason Patric, and Jack Huston. Both me and fellow PDCer Mae Abdulbaki saw this in Park City last year and neither of us was impressed and complained about its lack of depth. Perhaps the lackluster reviews is why it's quietly dropping on DirecTV beginning May 17th before hitting theaters in June.